Disclaimer: I received an Zwift RunPod to review as part of being a BibRave Pro. Learn more about becoming a BibRave Pro (ambassador), and check out BibRave.com to review find and write race reviews. Do you dream of running in far away places but simply can’t? I do. My husband, son and job are my number one priority and unfortunately, I can’t run or race in dreamy distant places. Not in real-life that is. BibRave recently introduced me to Zwift, a virtual platform to run and bike in with others from around the world in distant places around the world all from the comfort of my own home or gym. Now, this I can do! Cool to run virtually & you see a real map on Strava! Zwift is an app that connects to indoor training gear (a bike or foot pod) that allows you to run or bike on hundreds of miles in 5 worlds with other athletes from around the world. Think if it as playing Halo on your Xbox with other people but instead of your thumbs getting a workout, your entire body is getting a workout. You can just start running on your own with Zwift or you can train with one of their structured workouts. They have training plans for 5ks, half marathons and even triathlon events. Do you prefer to run with groups? This is where Zwift is awesome. They host hundreds of events — fun group runs like the BibRave 5k I participated in lat month to intense races with real prizes to be won. On Strava? 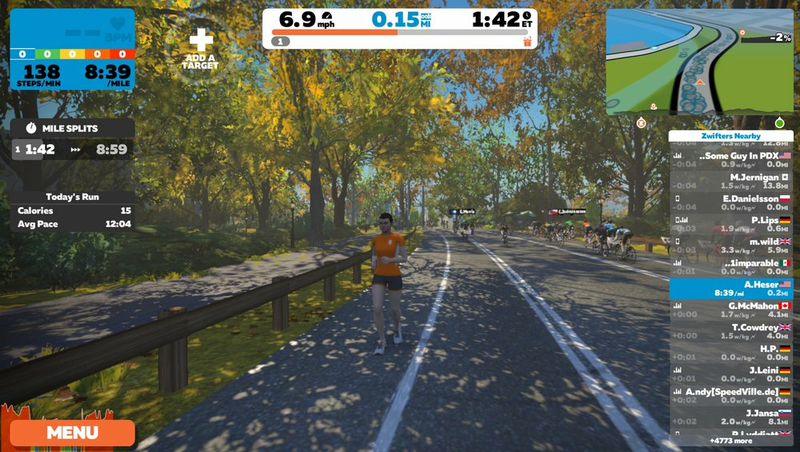 Zwift connects with third party apps like Strava and Garmin Connect so you can share your virtual runs from Zwift to those platforms and your friends can actually see the virtual map you ran! All of this got me super excited. Back in my teenager days, I was a gamer. Gosh, I wish Zwift was invented back then, I would have been getting fit instead of gaining weight because Zwift reminds me so much of playing a video game. It made running on a treadmill fun for me. I tested out Zwift using their RunPod. It’s the RunPod that allows you to connect to the app while you are on your home treadmill or on a gym treadmill. 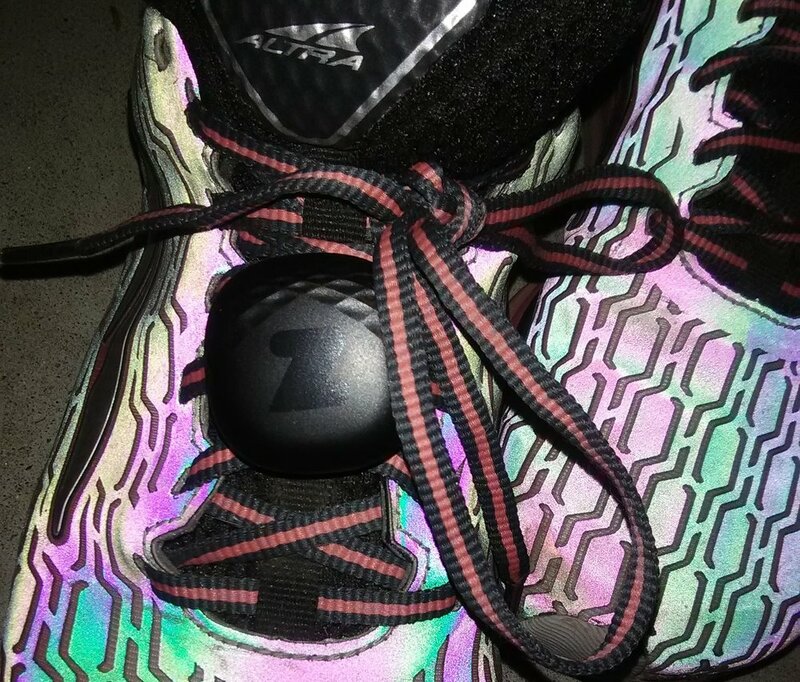 The RunPod pairs with Zwift via Bluetooth and attaches to the laces on your running shoes. It will measure your speed, cadence and distance through the Zwift app and thankfully it only weighs less than a half an ounce, so you don’t notice it’s on. It takes a standard CR2032 battery that is easy to replace. Zwift recommends removing the battery after each use to extend the life. Attaching the RunPod onto your laces — as well as removing the battery — is simple: hold the bottom and top of the RunPod in each hand, twist counter clockwise to remove base from pod. Now you can see the bottom of the pod and grab a coin or flathead screwdriver to remove the bottom to insert the battery. Match plus side of battery to the plus side of the foam backing on the bottom of the pod. Use a coin or flathead screwdriver to reattach the bottom while the battery is inserted. Now, grab a pair of your running shoes. Tip: It’s easier to attach the pod onto shoes that you haven’t put on your feet yet. Slide the base of the pod under two of your laces. I attached mine on the 4th and 5th row of laces. That worked best for me. Now, place the top of the pod on the base and turn clockwise until you hear an audible click. Make sure it’s attached properly because you don’t want to lose your RunPod. Tap your RunPod a few times and you’ll notice a green light glows. That means your pod is on and ready to link up to the app. Now that your RunPod is attached to you, it’s time to sync up to your app. Like I said earlier, there are a few ways to sync to the Zwift app. I decided to connect through a MacBook. It was easy to download the app. Once it was launched, make sure the Bluetooth on your device — laptop or phone — is turned on. You’ll see the RunPod syncing up. I took the extra time to customize my avatar. Although, I wish it had more facial and body customizations. Like, my body isn’t skinny like my avatar. I’d like her to be a size medium versus a size extra small LOL! Also, I’d rather my person have brown eyes than the blue default. Maybe I need to run more to get more options. I did notice that there were special clothing, shoes and accessories that could only be applied if they were unlocked. Now that all of my settings were updated, I was ready to run! You could either sign up for a group for a scheduled group run. There is a calendar on the right to see what runs are available, or you can check your Zwift Companion App for events that will start soon. Or, if you just want to run right now, you can. Click on the orange run button and start running. Once you are in the Zwift environment, you can see other runners. Sometimes you’ll see a cyclist. I notice some people chat with each other, I’m sure I’d trip on the treadmill if I tried to chat and run at the same time! The interface shows your speed, targets you’d like to make, other Zwifters, you can even change the view of your runs. One of the difficult things I found was selecting the turns. I like to do the bare minimum while running and deciding which way to turn is cumbersome. When I participated in the BibRave Group Run 5k, I realized I was going in a different direction than the group. It wasn’t until later that I noticed I could have gone their same direction if I chose that route during the prompts. I don’t own a treadmill, but after testing out Zwift, I’m thinking I should have asked Santa for one! Phoenix weather is dreamy right now and outdoor running is where it’s at. But come summer time, treadmill running will have to be done because no one wants to run in 115 degree full sun temps. It’s great how Zwift could keep you motivated during terrible weather either it be snow or full sun. Also, I like how I can be part of a group run even though I don’t have to be in their physical presence. I’m not the only one who thinks Zwift is cool. According to this Forbes article posted last week, Zwift raised $120 million (yeah, million) to expand its platform to running competitions as well as eSports tournaments. Do You Wanna Be a Zwifter? Ok, I know you do. It’s reasonable to join to Zwifting community. An account for runners is free (cyclists pay about $15 a month) and runners only need to purchase a RunPod. BibRave and Zwift partnered to offer 15% the cost of a RunPod with discount code BibRave15. That makes it $25.49 with free shipping in the U.S. Come Zwift with me and tell me what you think!